This week's challenge on SUDSOL was to make a card using black and white. You can use any color embellishments you like as long as the cardstock and ink are all black and white. I thought that sounded like a fun challenge so I decided to give it a try. I pulled out my Baroque Motifs stamp set for this one. The swirls were all stamped in Basic Black Craft ink and then embossed with Clear Embossing Powder. I used Shimmery White cardstock for the card. Between the cardstock and the embossing, this card really shimmers and shines. 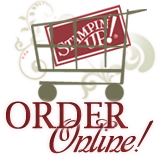 I *wish* Stampin' Up! carried this ribbon in black with white stitching. Wouldn't that be gorgeous? Since they don't have any, I used Rose Red instead. The little Fushion Flowers are also Rose Red. I added a Silver Brad to the center of each flower and attached them with Mini Glue Dots. I finished off the card with some paper piercing around the largest Shimmery White square. For the inside of the card I simply stamped part of the swirl image in Basic Black craft ink and embossed it with Clear Embossing Powder just like I did on the front. I kept it very simple. This card measures 5 1/4" square. It's Wednesday so it's time for a Diva Coffee Break Design color challenge. Those colors look so cute together on that pillow, but getting them to look cute together on a card....not so easy! I'll admit I was sorely tempted to leave the Pink Passion off the card. The design for the quilt card came from Julie HRR on Splitcoast. If you're a member of the SplitCoast Fan Club, you can view the directions here. Each of the strips was cut 3/8" wide and the center is 1" square. I stamped each of the strips with the little flower stamp from the Sprinkles stamp set. If you'd like to join the challenge, simply create your own card using the color combination above. Come back here and leave a comment so I can check out your creation. If you upload your card to SplitCoast, please use the keyword DCBD112. Be sure to check out the blogs of the other design team members to see their creations. Thank you for all of your well wishes for my son. I'm happy to say this his fever is gone and he has much more energy. I still kept him home from school today just to make sure it doesn't flare back up. He didn't waste any time asking me if he could play video games today so I know he's feeling better. While he got a chance to play video games, I slipped into my stamp room to make a card. I used Julee's Mojo Monday sketch for inspiration. I stamped both the flower image and the sentiment in Chocolate Chip Craft ink and then embossed the images with Clear Embossing Powder. I love the dimension embossing adds to a card. I only wish I could capture the look in a photo. I used my Janome Sew Mini to sew around the layers of my card on both the outside and the inside of my card. Whenever I don't post a picture of the inside of my card, I get several requests to see what it looks like. I'll try to be better about remembering to show you the inside as well. I like to keep the inside of the card pretty simple--no embellishments (brads, ribbon, etc.) and no dimensional layers so the card will lay flat when closed. The front of my cards are usually bulky enough without the added bulk from the inside. The other day I was blog hopping and came across this great project by Kimberly Van Diepen. Isn't it cute? Be sure to visit Kimberly's blog to download the directions for yourself. I made a couple of small changes to her design. I used a different wheel, I left off the pearl, and I changed the scalloped circle punch to Pretty in Pink so it would stand out more. We made this project at my monthly downline meeting and they all loved it. This box is perfect for holding 3" x 3" cards, candy, small gifts, and more. Give it a try, you'll love it. Thanks for the great idea Kimberly! I've been the lucky recipient of several blog awards. I received the Butterfly award from Jean, Jean (a different one! ), Nicci, and Leonie. I've also received the Lovely Blog award from Jean. April was kind enough to give me this blog award. Here's what is written about this award. This blog invests and believes in the PROXIMITY - nearness in space, time and relationships! The following blogs are exceedingly charming. These kind bloggers aim to find and be friends. They are not interested in prizes or self-aggrandizement. Our hope is that when the ribbons of these prizes are cut, even more friendships are propagated. I also received the Marie Antoinette award from Judy. Today I have a cute bag to show you along with a tutorial. I've seen these little bags made out of the Top Note Die pop up all over the internet so I decided to give it a try. I don't know who originally came up with this idea. and the back of the bag. I made the front and back look pretty much the same. I just used a different die cut flower. As you can tell by the pictures, you need two Top Notes to make this bag. The first step is to decorate both Top Notes with designer series paper. Once you've done that, set one of them aside. You'll only be working with one Top Note in this next step. I needed to mark where the oval punch for the handle would be. I punched out a small oval from a piece of scratch paper (pink in the photo) and adhered it on the designer series paper right where I wanted it. I turned my small oval punch upside down and lined it up with the pink oval I adhered to the designer series paper. Then I punched it out. Next I stacked both of my Top Note pieces on top of each other. You'll notice that I have the cardstock backs facing each other. MAKE SURE you have the bottom Top Note oriented correctly so you're punching the oval out of the top section of designer series paper. Line them up exactly on top of each other. Turn the small oval punch upside down and use the punched hole in the first Top Note as a guide for punching the hole in the second Top Note. Here's where I made a small error. After you have punched out both ovals, then you want to attach your ribbon to the Top Note. This way the ends of the ribbon will be behind the bag. I didn't realize this until later and had to go back and try to peel up my Sticky Strip...not a good idea! So learn from my mistake and attach your ribbon now. The center part of this project is made from a small paper bag. They're just like paper lunch bags, but much tinier. They measure 3 1/4" x 2 1/4" x 6 1/2". I bought mine at Michaels and I've also seen them at Target in the birthday party section. Cut your mini lunch sack down to 3" tall. Turn your bag so that the bottom of the lunch sack is facing down. Add Sticky Strip around all four edges of the bag. Peel off the red liner and adhere the bag to the cardstock side of the Top Note. Make sure that the oval punch is at the top of the Top Note. As you can see in the photo above, the bottom of the bag is now on top. Fold the bottom of the bag down. Add four more pieces of Sticky Strip around the edges of the bag. You do *not* want any Sticky Strip on the bottom of the bag. See, here's where I realized my mistake and had to find a way to get the ends of the ribbon behind the bag. Peel off the red liner on the Sticky Strip. Very carefully line up the second Top Note with the one on the bottom and adhere it in place. As you can see, the white paper bag is showing through the oval that was punched out earlier. Open up the Top Note bag and insert your oval punch upside down and punch out that piece. Flip the bag over and repeat it on the other side. Now you can fill the bag (I filled it with Peppermint Patties), tie it shut with some ribbon, and finish decorating the Top Note bag. It's Wednesday and that means another Diva Coffee Break Design challenge. This week Heidi gave us this great sketch to work with. I thought I'd give you a break from the Raspberry Tart DSP so I used the Valentine Bundle instead. The square panel on the card is 3" square and could easily be used on a 3x3 card. If I had thought about it before typing up this post, I would have made it into a 3x3 card too. I used my Coluzzle to cut a circle out of the red DSP so the Pink Pirouette cardstock under it would show. I stamped and layered my scalloped image and attached it in the center of the circle with dimensionals. As you can see, I made a couple of slight variations from the sketch. I added three hearts to the side of my card instead of two. I also only used ribbon on the bottom of my card and didn't add a sentiment there. The scalloped circle has words on it and I couldn't think of what other sentiment to add to "hugs and kisses." That's part of the fun of these sketch challenges--you use them as inspiration for your card. You don't have to stick to them exactly. If you'd like to join the challenge, simply create your own card using the sketch above. Come back here and leave a comment so I can check out your creation. If you upload your card to SplitCoast, please use the keyword DCBD111. Be sure to check out the blogs of the other design team members to see their creations. I wanted to thank all of you who sent me information on migraines yesterday. It sounds like I have a lot of tracking to do until I can figure out what's causing my son's headaches. Thankfully he's feeling much better today. With the children back in school, that means I had time to stamp today--yeah!!! I used Julee's wonderful mojo sketch as my inspiration for today. Don't you love the bright colors of this Raspberry Tart designer series paper? I love it! I think I've used it on just about every card I've made lately. This paper is so bright and cheerful that it makes me happy when I use it. It has been a while since I've use my Felt Fushion Flowers so I used them as the focal image of my card. The main flower is layered on some Kiwi Kiss colored DSP, so I made the stem of my flower Rose Red instead of green. I looped a couple of small pieces of ribbon and stuck them together with a Mini Glue Dot for the leaves. I *very* carefully sewed around the circle layer on my card. I did each stitch individually (by turning the wheel on the sewing machine manually) so it would look nice. I think once I have more sewing experience under my belt I might try it with the foot pedal. Right now I'm not brave enough yet! The word "Thanks" is from the Thank You Kindly stamp set. The stamp actually says "Kind Thanks," but I only inked up the "Thanks" part. Click here to see how I layered the Curly Label punch. I also added some paper piercing under the "Thanks" and in each of the scallops. My poor paper piercer has been neglected ever since I got my sewing machine. Today is the first day of the new 2009 Spring-Summer Catalog! I love having new stamps and accessories to play with and can't wait until my new order gets here. You can now order the new products online at my website here. If you ordered a catalog from me (click here to see how to order one), they're on the way to you. I've been trying to find some time to stamp today, but with all of my children home from school today for the holiday...it's just not happening. Plus I woke up this morning to my oldest sick with a migraine. Do any of you have any advice you can share with me on tracking migraines? My mom and a couple of my siblings get migraines, but neither my husband nor I have them. My siblings all got them as adults and they've been able to figure out what triggers their migraines. I have no idea what to do to track my son's migraines to figure out what's causing them--food? lack of sleep? smells? I'm clueless. Maybe there are other causes that I don't know about. Luckily he doesn't get them too often, but that just makes it that much more difficult for me to track. If you would like to purchase any of these items, either email me (DannieGrvs@hotmail.com) or order online ("shop now" button in the upper right corner) before these items are gone for good. Monday, January 19th marks the beginning of the NEW Spring-Summer Idea Book & Catalog! I have my copy of the new catalog and Stampin' Up! has done a fantastic job! It's packed with new stamp sets, ribbon, buttons, big shot dies, and more. Would you like to have your own copy of the new catalog? You can get one two different ways. Place on online order with me between February 1st and April 30th and receive on FREE with your order. No minimum order required! Paypal me $6 using the link below to cover the cost of postage and I'll drop one in the mail to you today. US residents only please! !